How does a former research scientist and introvert become a top sales leader? For David Priemer, founder of Cerebral Selling, it was the result of curiosity combined with a desire to make the sales process feel more human. And while he may have an unusual background for the world of sales, his achievements speak volumes about the value of his unique perspective: Before striking out as a trainer, he was a founding member and head of product at Rypple, which was acquired by Salesforce in late 2011. He then went on to lead Sales Leadership Academy, also at Salesforce, before serving as Vice President of Sales at Influitive. These days, Priemer regularly trains, speaks and writes about sales best practices, evangelizing a practical approach that feels grounded in both science and real-world experience. We were lucky to sit down with him recently for an episode of Seeking Wisdom, which you should check out right here. But, in the meantime, here’s a recap of what we learned. Priemer has been in the unique position to observe three pivotal shifts that have impacted the B2B sales space over the last twenty years. During our chat, he told us how they’ve impacted sales reps, customers, and how we buy. There are more solutions than ever before. 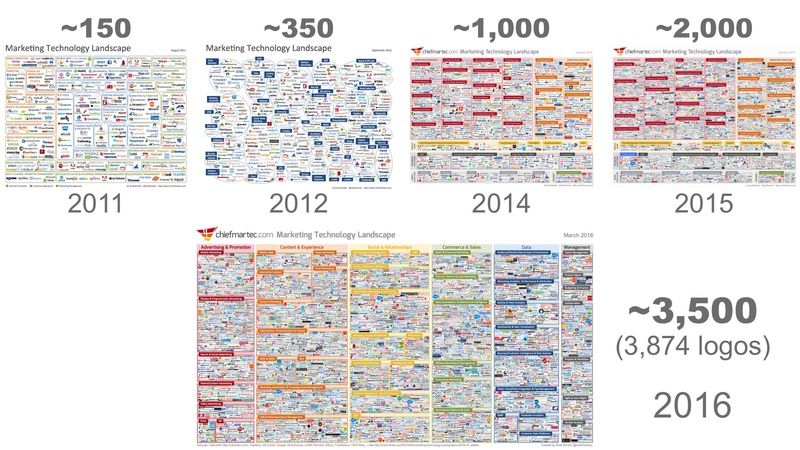 In 2011, there were about 150 solutions in the marketing technology landscape. Just six years later, the space had exploded, giving rise to almost 5000 solutions in total. Naturally, Priemer says, this has made sales incredibly noisy. And, he points out, it has also had the effect of making it near impossible for customers to differentiate one product from another. Attention spans have shrunk to miniscule proportions. A byproduct of this saturated market? Sales reps are competing for the limited attention spans of the same set of prospects. “We’re inundated with all sorts of stimulus… So people just don’t have time. Their lives are so fast… They don’t have time to care and pay attention [to what we’re selling],” Priemer says. Modern selling really hasn’t caught up to how people actually buy. Today, B2B sales is still mostly practiced the same way it was twenty years ago. Yet buyers have changed dramatically. There’s more competition than ever before. It’s something David Cancel, our CEO here at Drift, has talked about extensively, and underscored during our Seeking Wisdom chat. “It’s so radically different that people don’t understand: you know, five, ten years ago… maybe you had five competitors if you were in a really, really hot market… And now you have thousands. So how do you stand out? How do you differentiate? How do you build a product?” asked Cancel. For Priemer, you stand out by simplifying your sales process, and making it more human. “The biggest thing, because there’s so many solutions and attention spans are so slim… the number one thing is you need to be able to overcome inertia. A lot of times people think of a selling system, and a lot of selling systems start at discovery. Alright, you’re sitting down with your customer, and now you’re going to go through your list of questions, and you’re going to find out what their pains are. And my feeling is like, You should be so lucky sitting down with your customers talking about their pains, you know. “This is just really about doing what works,” explains Priemer. Far too often, businesses over-complicate B2B sales, choosing process over people. And, says, Priemer, their sales activities have nothing to do with how customers really want to engage during the buying process. “Look, the data tells us that people buy from people they trust, they buy on recommendations from peers…the data tells us that most messages fall flat, [and]…most people, when they look at your website, have no idea what the hell it is that you do,” Priemer explains. ✔Do our sales activities establish trust with potential customers? ✔Does our messaging resonate with prospects? ✔Is it easy for people to ask questions and find out what you do? Priemer reminds sales professionals of the powerful role human emotion has in the sales process. Which is why sales reps must have empathy for prospects with a process that builds rapport, and drives trust. “Feelings are a big driver [on the path to purchase],” he explains. “When you subject someone to your discovery list of questions, you erode the trust in a relationship,” says Priemer. “I got news for everyone–you don’t have any control,” he says, referring to the buying process. With more information available than ever before, customers are in control. So, he says, don’t work against them, work with them. Priemer may have had an unusual path to success in sales, but his scientific approach and process of “cerebral selling” should prompt sales teams to reflect. If you’re not getting the results you want, it may indicate you’re not focused on what matters the most: your customers. But, he says, course-correction is possible if you’re willing to let the customer take the lead, and inject your sales process with real empathy for your buyer. Subscribe to Seeking Wisdom on iTunes and listen to the full episode with David Priemer.